The rejection of the Sterling Area has the complete support of the main unionist parties: Conservatives, Labour and Liberal Democrats, expressed respectively by Osborne, shadow Chancellor Ed Balls and Chief Secretary to the Treasury Danny Alexander. As it happens, Alexander is a Scot and MP for Inverness; in a separate speech, he confirmed the refusal was final. In addition, the rejection has the public backing of Sir Nicholas Macpherson, the most senior civil servant in the UK Treasury. This is remarkable; it is almost unprecedented for a civil servant at that level to make his views publicly known. This cannot simply be dismissed as the word of one evil Tory. We can reasonably assume Osborne, Balls and Alexander detest one another, but on this point they are united. Together with Macpherson, it is fair to say they speak for the entirety of the unionist political establishment. The continuing UK would be at risk of providing taxpayer support to the Scottish financial sector and sovereign. An independent Scottish state would not face the same risk as it is inconceivable that a small economy could bail-out an economy nearly ten times its size. In other words, careless behaviour by Scottish banks or the Scottish government could place rUK in a position of having to bail them out in order to maintain the value of the pound. This is far from a theoretical risk. Only six years ago, the Royal Bank of Scotland required a £46 billion bailout by UK taxpayers. Similarly, it is possible an independent Scottish government would run up an unsustainable level of public debt. cede substantially more sovereignty on monetary and fiscal matters than any advocates of independence are currently contemplating. What if Scotland did give these assurances? Political parties in Edinburgh might blame restrictions imposed by London for all manner of problems in Scotland. It would closely resemble the current situation with an SNP devolved government. In the medium to long term, this would create strong political pressure for Scotland to leave the currency union. At a minimum, the uncertainty could have a negative impact on the value of the pound. It is not surprising the unionists prefer a clean break to this scenario. In economic terms, the SNP's response is that rUK has so much trade with Scotland, it should create a Sterling Area to lower transaction costs. This is weak on the face of it: More than 40% of rUK's external trade is with the eurozone, and only 10% with Scotland. By this argument, rUK should adopt the euro at once. More importantly, the argument from transaction costs does nothing to address the problem of asymmetry. The SNP simply declares it doesn't matter, and the unionist parties are making a big fuss over nothing. Alex Salmond has made furious speeches about Westminster's high-handed behaviour in this matter, but he is being at least as arrogant as they are. It is not for Salmond or the SNP to decide how the interests of England, Wales and Northern Ireland are best served. Which is more important, transaction costs or asymmetry of risk? It is difficult to weigh one against the other. The former would be an ongoing cost which is straightforward to quantify. The latter is much more uncertain but its costs could be enormous, as in the case of the RBS bailout. The BBC gives a breakdown of the claims on each side, while Gavin McCrone, former chief economist at the Scottish Office, has discussed the feasibility of a Sterling Area. Professor Adam Tompkins considers the legal implications from a unionist perspective. Shadow Chancellor Ed Balls has set out the Labour Party's reasons for refusing a Sterling Area; on the nationalist side, the Scottish Government's Fiscal Commission Working Group provide reasons to support it. I am not an economist, and I don't have the expertise to fully evaluate the technical merits of a Sterling Area, but it is clear the unionist parties have taken a risk-averse option. They would rather accept the transaction costs than take on the additional risk of a large-scale bailout, or the prospect of the Sterling Area breaking down at some unpredictable time in the future. Government requires this sort of political judgement call, and it is the responsibility of the rUK parties to make it. In addition to the economic calculations, there is a wider political dimension. As Tompkins observes, a Sterling Area would not only require Scotland to cede some sovereignty to a shared central bank; the same would be true of rUK. The rUK government would have to negotiate on fiscal matters with an independent Scotland. Giving up national sovereignty is not popular in rUK. The recent rise of the UK Independence Party is evidence enough of that. Any rUK government would face great difficulty in legislating for a Sterling Area, and it is far from clear that the benefits for rUK would make this worthwhile. Of course, there are other political motives for the rejection of a Sterling Area. It is undoubtedly calculated to boost the No vote in the referendum. Be that as it may, refusal has a reasoned economic justification and would be supported by public opinion in rUK. A Sterling Area will not happen without the consent of the rUK parties. They have chosen not to give it. If the SNP are truly in favour of national self-determination, they should understand this. Whether they understand it or not, the SNP will have to face the consequences of this refusal. 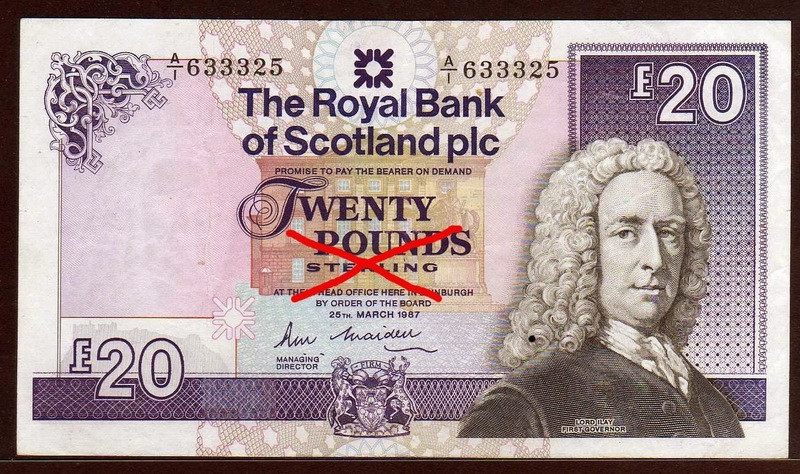 Programming note: The currency options for an independent Scotland are a big, complicated topic. I will be writing a few more posts on this subject, which may well be the decisive issue in the independence debate. Part 2 covers the SNP reaction to Osborne's speech, including the argument that the pound is "Scotland's currency" and cannot be taken away.